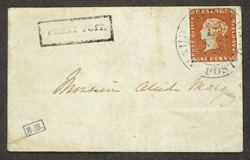 Mauritius 1847 "Post Office" 1d. orange-red, used on cover. bl.uk > Online Gallery Home	> Online exhibitions	> Philatelic rarities	> Mauritius 1847 "Post Office" 1d. orange-red, used on cover. Some of the 1d stamps were used on covers that contained invitations to a Ball organised by Lady Gomm the wife of the Governor. Three such covers exist today and are of the first importance in philately.